Taken this morning, here is a pic of Jarvis enjoying one of the beaches that dogs are allowed on all year round (not all beaches are open to dogs all year). There are many, many dogs in Folkestone and it is a great place to bring your four legged friend for a day trip! 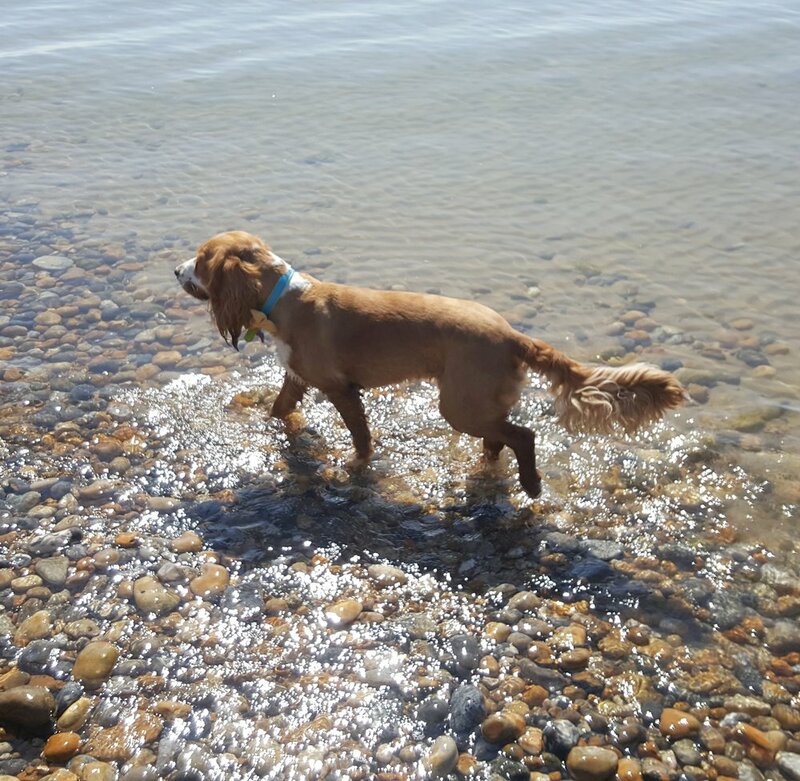 Since getting my dog, Jarvis, in mid 2016, I have become much more aware of how few places often allow dogs, or how some of the places that do are not always suitable for my energetic ball of spaniel/poodle lunacy. I thought it may help visitors to Folkestone to let you know where the dog friendly cafes and shops are and the best place for walks, which beaches are ok for you to take your dog to and those places where dogs are not permitted. This post is not exhaustive and I will add to it as and when I get time. It is also based on my own experience, which I hope is correct, but do check venues etc yourselves as things can change I guess at any time - a venue can be dog friendly much of the time but if there is something going on in there they may need to restrict dog entry (e.g. fragile artworks out/in progress, shoots, a number of dogs in shop already etc, wet dogs etc). I am putting this together over a few weeks (and will improve links, and a map option when I have time), please check back for more content! UPDATE MARCH 2019: THIS IS A BIT OUT OF DATE - I HAVE MISSED OFF A BUNCH OF FANTASTIC PLACES SO HAVE QUICKLY TRIED TO LIST A FEW BELOW (sorry I don’t have much time at the mo to go into details about them and hopefully I have them right!) BUT THIS LIST IS NOT COMPREHENSIVE. FEEL FREE TO ADD PLACES IN THE COMMENTS! I should pre-empt this by saying that taking a greedy, lively adolescent spaniel/poodle thingy into any dog friendly cafe is a bit of a challenge at the moment. All of the below cafes allow dogs inside at the time of writing unless specified otherwise. - Steep Street cafe - always very welcoming to Jarvis, though Jarvis does have a habit of trying to disrupt everyone at the tables (sorry, everyone). A couple of outside seating options too. - La Caffe Villa AKA BELLA VITA - a brand new and gorgeous large cafe/restaurant from the owners of London's Broadway Market's Bella Vita has just opened towards the bottom of the Old High Street. Full of gorgeous Italian options, pastries etc, the space is dog friendly and quite large. - Benny's cafe - has a small outside seating area at the back so I take Jarvis there. Lovely Italian food, delicious pasta and coffee. - Follies restaurant on the Harbour Arm - the harbour arm itself is dog friendly, and Follies (pizza, pasta) allow dogs too (certainly in the covered seating area in the corridor). The Harbour Arm is not open all year so do check before visiting. - The Hideaway - new cafe and restaurant on Bouverie Road West. - Follies restaurant on Sandgate Road - there are two branches of Follies in town. - Brew cafe - great cafe on the way from the station into town (the short walk!) with great freakshakes, cakes and my favourite avocado on sourdough. - The Radnor Arms - new - gorgeous pub which is dog friendly and has an outside seating area too. This is one of my favourites. - my understanding is that dogs are allowed on all beaches October 1st - April 30th and can be on or off lead. - 1 May - 30 Sept: dogs are NOT permitted on Sunny Sands nor Mermaid Beach. They also have to be on lead on the promenade around Mermaid Beach. During this time, I take my dog to the beach with the Boardwalk (but be careful once getting close to Mermaid Beach) plus also the beach area between Mermaid Beach and Sandgate (note that some Sandgate beaches are also restricted I understand) and The Warren beach. The Warren is the best for a good off lead run without worrying about the dog venturing quickly into restricted areas. - The Leas Coastal Park - dogs are allowed all year but some areas require the dogs to be on lead (e.g. the kid's play area - they must be on lead there). Other parts of the park just request to please keep your dog "under control". I do not have a definition of "under control" so would advise you to make your own enquiries if needed. You'll see many dogs off lead in this part, and mine loves it. This park provides plenty of space for dogs to run and explore plus is right by the beach too (though be careful of the restricted Mermaid Beach May - Sept). 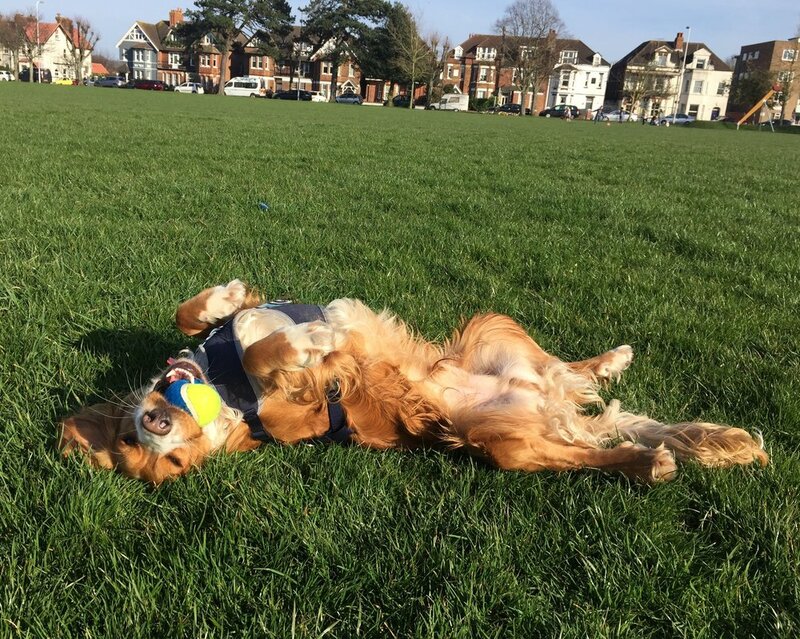 If you have a particularly greedy dog like mine, try to avoid off lead visits on very sunny days during the summer from 11-6pm as there are lots of picnics and BBQs. Sadly, a lot of people seem to leave their rubbish behind too. My dog loves this but it looks very messy esp on a Monday morning (why are people SO LAZY???) and I am mindful of foods being left that would not be good for him etc - i find myself having to take numerous bones out of his mouth every day over the summer, so just be mindful of this. Cars are permitted into the park towards the west part of it so be watchful also. It is generally very quiet apart from very sunny days when more cars will be parking up there. - Radnor Park - this is the park near to Folkestone Central Station. When I last enquired, dogs were allowed off lead everywhere apart from by the children's play area (for obvious reasons). If you can't trust your dog off lead on this park (picnics, roads nearby etc) there is also an enclosed dog run. Also, towards the north side of the park, there are two large ponds (ducks, fishing etc) plus an area with a stream and walkways which I find ideal for my dog. - Larger enclosed dog run further West near the sports centre just off Cornwallis Avenue (aka Three Hills). This is quite a large run with slopes and often you'll find water left out too. - The Warren - this is further out towards the East and a real treat for dogs and walkers alike. Quite a few of the shops in the Creative Quarter are dog friendly. It is always worth asking though and using common sense. For instance, although I sometimes have my dog in Sentient with me, there are times I do not want him, or other dogs, in a shop full of fragile artwork, so some days I leave him depending on what is out/what I am working on etc, and particularly if raining (I don't want dogs shaking wet fur over the shop contents). So, I myself am a shop owner in a shop which is largely "dog friendly" but I will sometimes turn dogs away, especially if there is already one in the shop, or I have something particularly fragile going on e.g. if I am putting together a new artwork on the floor, have my drill and glass out etc, I do not permit dogs into the shop for obvious reasons, nor if I have neon pieces leaning against the walls waiting for collection. Do always check with the below shops before you enter./before your dog runs in. Bounce Vintage - large vintage megastore in the lightbulb building full of affordable everyday vintage clothing the owners are welcoming to dogs and often have a biscuit on hand for canine visitors. Atelier FeralChild - beautiful clothing and accessories hand picked by stylist Helga Da Fonseca Shaw. Delicious California on the OHS - dogs are permitted inside and these guys usually have a bowl of water out. i’ll add more/update this as and when I have time. HAVE I MISSED OFF YOUR DOG FRIENDLY VENUE? IF SO PLEASE DROP ME AN EMAIL AT CONTACT@SENTIENTROOM.COM AND I WILL UPDATE MY LISTING.